It is time to feel the thrill. A colossal money storm is coming. Gayle Storm is coming today at 5 PM! India’s largest poker site – adda52.com is always searching for ways to reward poker players in India. Going forward, the poker site recently announced Gayle Storm, an online poker event named after the ‘Universe Boss’ – Chris Gayle, who has joined Adda52 as its brand ambassador and will be working towards promoting poker through brand’s online and offline activities and campaigns. 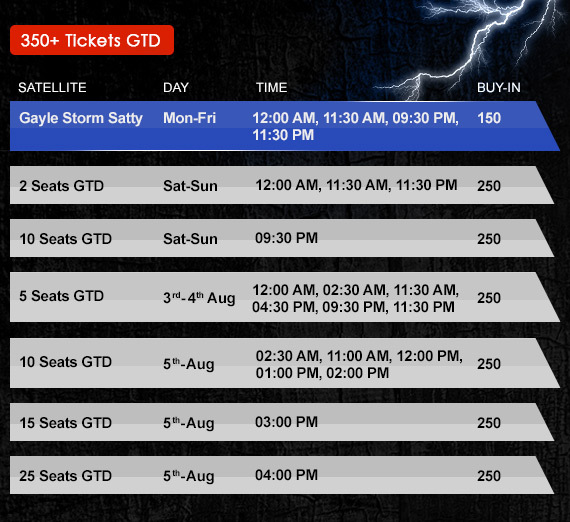 Starting today at 5 PM, Gayle Storm is a colossal money storm that features INR 50 Lac GTD prize pool at as low as INR 2500 buy-in. Indeed, it is a super-value tourney with enormous money coming in small buy-in. Adding to the delight of players who cannot afford even INR 2500 buy-in, adda52.com is hosting special satellites wherein players can compete at just INR 150 to INR 250 and win a ticket to Gayle Storm. Today is the last chance to play satellites, so hurry up and win a ticket for yourself! For the additional details about Gayle Storm on adda52.com, feel free to visit this LINK!